The Prochem Contract Carpet Extraction Cleaner is a powerful, safe and economical low foam detergent concentrate for use in carpet soil extraction machines. Contract Carpet Extraction Cleaner is suitable for use on most carpets, subject to pretesting. This product is available in a 5 litre bottle that can be purchased as a single quantity or as a bulk buy option. The Prochem Extraction Plus is a professional low foam emulsifier for carpet soil extraction machines. This product comes in a 5 litre bottle making it ideal for commercial use. As well as this, the Prochem Extraction Plus is available to purchase as a single product and as a bulk buy option. The Prochem Carpetclean XL is a high concentrated, phosphate-free extraction detergent for use in portable and truck-mounted extraction machines. Certified to AMS1631A for aircraft carpet cleaning. Dark green turquoise Liquid with floral citrus fragrance. The Prochem Fibre & Fabric Rinse is a professional acidic rinse agent for neutralising alkaline pre-sprays and stabilising colours. Approved by the 'Woolsafe' Organisation for use on Wool and Wool-rich carpets. Prevents most colour bleed, yellowing and browning and conditions all natural and synthetic fibres. Orange liquids with new fresh orange peel fragrance. The Prochem Liquid Woolsafe is a safe and effective extraction cleaner for wool and stain resistant nylon carpets. This product is approved by the ‘Woolsafe’ Organisation for use on wool and wool-rich carpets. It comes in a 5 litre container making it ideal for commercial cleaning; it is available to buy as a single product or as a bulk buy option. The Prochem Fibresafe Gold is a safe and effective powder extraction detergent for wool and stain resistant nylon carpets. Approved by the 'Woolsafe' Organisation for use on Wool and Wool-rich carpets. Fibresafe Gold incorporates a self-neutralising pH system which reduces the risk of colour bleed, texture change and re-soiling. Yellow powder with green apple fragrance. Economical commercial extraction detergent, for use on synthetic carpets. Contains water softeners, builders, surfactant and corrosion inhibitor for safe and effective results. White powder with lemon fragrance. Prochem's premium non-ionic carpet cleaning extraction detergent for specular results on tough, oily and greasy soils. Crystal Green's unique non-ionic formula is compatible with B125 Clensan for cleaning and sanitising in one pouration. Green powder with herbal lemon fragrance. The Prochem Double Clean is a concentrated heavy-duty extraction detergent, formulated for optimum performance in cleaning heavy soiled carpets. Double Clean contains high quality anionic and non-ionic surfactants, alkaline builders, optical brighteners and corrosion inhibiter. Blue powder with herbal lemon fragrance. The NEW Prochem Heat Wave is a super-strength Powder detergent for use in the most powerful truck-mounts. Performs at high temperatures while maintaining stability and 100% clarity. Prochem Heat Wave's ingredients will not separate under high heat, reducing residual deposits and clogged wands. Orange powder with tropical lemon fragrance. A concentrated deodoriser and air conditioner containing a unique blend of high quality lemon fragrances and other odour neutralising ingredients. 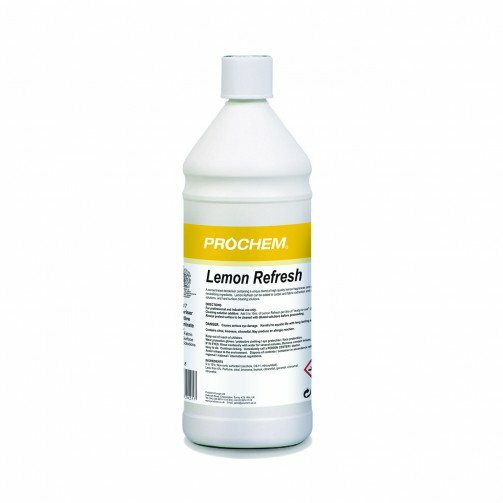 Lemon Refresh can be added to carpet and fabric extraction and shampoo cleaning solutions and hard surface cleaning solutions. Cleaning solution additive: Add 5 to 10 ml of Lemon Refresh per litre of "ready-to-use" cleaning solution. Always pre-test surface to be cleaned with diluted solutions before proceeding. Can be added to extraction, shampoo or any general cleaning solution.